Options files are text files that are read by the Flexnet license manager, and implement rules and restrictions to concurrent FlexLM licenses. 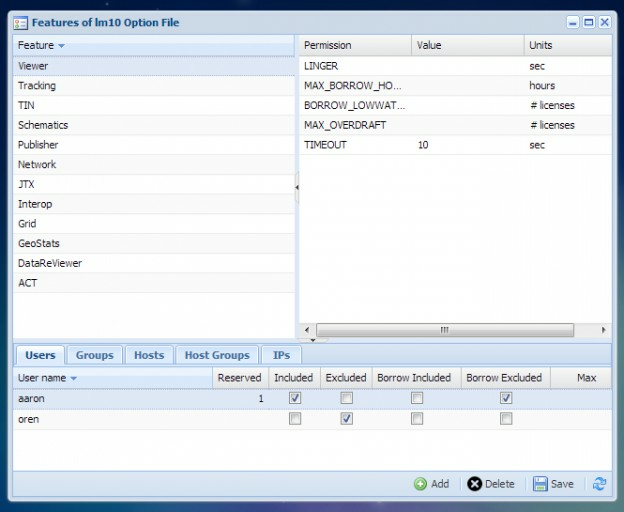 Options files serve as an interface for license administrators to apply preferences for usage of licenses within license pools. Options files are not easily maintained manually. They implement usage rules and apply them to different entities in the organization. As organizations grow, Options files become lengthy. Moreover, the dynamic nature of an organizational structure may render manual updating of options files imposible. OpenLM Options file Management extension. The OpenLM Options File management extension is a GUI within the OpenLM EasyAdmin web application. It clearly presents the different features and rules that are applicable in the options file. It may be configured to periodically update the actual Options file on the license server, and saves License Administrators from wasting valuable time on an error prone process. Aaron is included as a license user, and being reserved 1 license. Oren is being excluded from usage. The Timeout period for ‘Viewer’ is set for 10 seconds. The OpenLM system may be configured to synchronize with the organizational Active Directory (LDAP). The OpenLM Server will maintain an image of the organization’s group structure with member’s usernames and other attributes on a relational Database. The OpenLM Server is connected to the OpenLM Broker, normally residing locally on the license server machine. The Server compiles the required Options file, and transmits it to the OpenLM Broker. The Broker will save the new Options file, and invoke a license server reread – in order to update the license server. 1. The options file extension facilitates applying restrictions and permissions to different categories of users: Users, Groups, Hosts, Host groups and IP groups. IP: assume a user is roaming through a domain with a laptop, obtaining a dynamic IP along the way. Network licenses may be made available according to their location; e.g. – A Matlab license will be made available in in the vicinity of a faculty lab, but not in the Cafeteria. Hosts: The same can be argued for ‘Hosts’, i.e machines that have changed their work environment. RESERVE: Reserve licenses per entity (User / User group / Host / Host group of users/hosts). INCLUDE: Allow a user to use a feature (implicitly denying other users from doing so). EXCLUDE: Deny a user access to a feature. BORROW_INCLUDED / BORROW_EXCLUDED: Allow OR DISALLOW a user FROM borrowing licenses. 3. Set global policies per features or all features, such as the TIMEOUT period, which should configure the minimal time a feature is idle before the license manager itself would retrieve it to the license pool. This capability is in fact ineffective through the Options file; a more decisive method is the OpenLM Active Agent extensions. 4. The Options file management extension can be set to update the Options file automatically on the license server daily, on a predefined time. 5. The changes made to the Options File are applied on the license server without the need to log into the license server. The license server reread command is invoked by the OpenLM Broker. For further reading please refer to this Application Note.